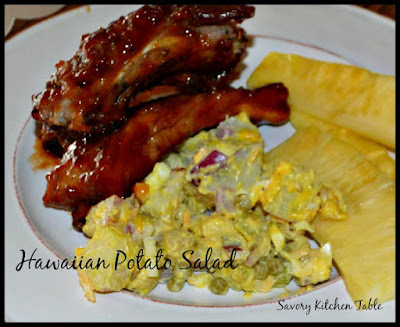 The original recipe I found said it was where Macaroni salad meets Potato salad in a Hawaiian classic. I've made a few adjustments due to my mustard allergy and family likes/dislikes. I also made a couple instructional changes to make it easier to prepare. This is the perfect accompaniment for my Aloha BBQ Pork Ribs. I make EVERYTHING without mustard due to being deathly allergic, but hubby always adds mustard in so it is up to you whether or not to add mustard. Add potatoes to salted boiling water, cooking until tender, about 15 minutes. Drain and rinse in cool water. Add pasta to boiling water, cooking to al dente. Drain and rinse in cool water. While potatoes and pasta are cooking and cooling, prepare dressing. Whisk together the mayonnaise, apple cider vinegar, sweet pickle relish, salt and pepper. Fold in pineapple, pickle pieces, red onion and grated cheese. Chill 12-24 hours for best flavor.